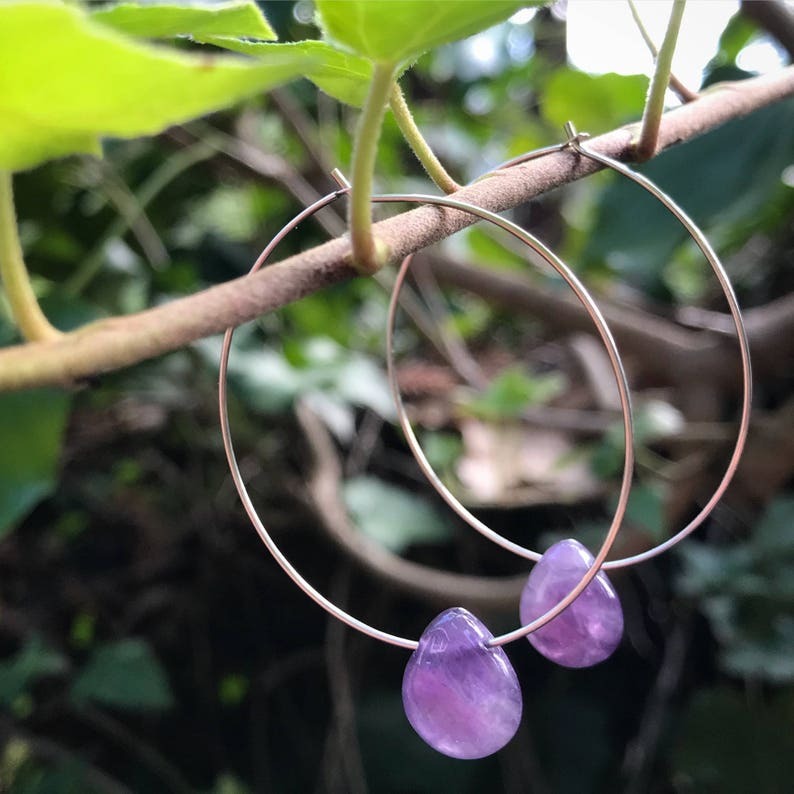 Amethyst Hoop Earrings. Amethyst tear drop stones that have a beautiful purple / lavender color on Sterling Silver 1.5" hoops. Not too big and not too small, the simple elegance of these earrings give them a unique look that can be dressed up or down. Not only the February birthstone, Ultra Violet is the Pantone color of 2018 so you must have something of this shade in your wardrobe. These amethyst earrings will give you the pop of color you're looking for. Amethyst is the most highly valued gemstone of the macrocrystalline Quartz family. It has more iron oxide than any other variety of quartz, and experts believe that the violet color is the result of its iron content. It is said that Amethyst magnifies psychic abilities and right-brain activity. It is credited for strengthening the immune system, while energizing and purifying the blood. Some believe it to also be beneficial in relieving headaches and improving blood sugar imbalance. Amethyst is the modern birthstone for the month of February and people born under the zodiac sign of Aquarius (Water Bearer). It is also the anniversary gemstone representing the 4th and 6th year of marriage. Please email or convo me know if you have any questions about these earrings! ❤️ - please take a moment to favorite my shop and any items you think are cool. Greatly appreciate your interest. Packed in an organza bag thus gift-giving ready! If you have a change of heart, you can cancel your order for a full refund within 24 hours. Just email or convo me. Beautiful stone, love the style. Arrived very quickly. Will definitely be ordering more pieces from this shop! Great for gifts as well.